Happy Easter! I had a busy Sunday- starting at 6AM to prepare Easter brunch at the hotel, and then leading to a 4pm service at 4pointes church. It was a refreshing service filled with celebration and remembrance. 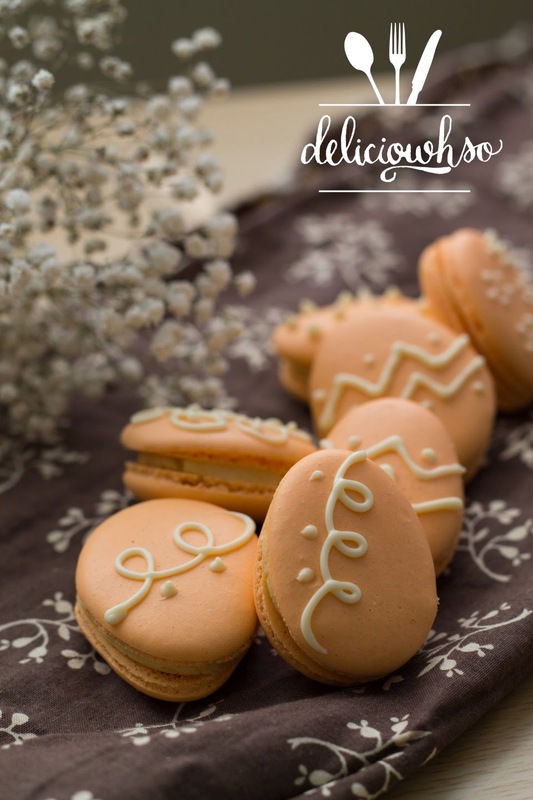 I brought some Easter egg-shaped macarons to church with me, and they were a big hit! These macarons are festive, delicious, and adorable! It's made almost the same way as any macaron, with a slightly different piping technique. 5. Use grease-free beaters on high speed to whip the egg whites to stiff peaks. Add in the gel color. You want a very full color because the added almond flour and sugar will dull the color. 2. Place the egg white and sugar into a medium sized, heat proof, grease-free bowl. Place the bowl on top of the pot of boiling water. 8. Reduce orange juice in a frying pan until it becomes thicker- it will look like a puree or sauce. 9. Place the frying pan into the refrigerator to cool the orange reduction. 10. Add the orange reduction to the buttercream and whip until completely incorporated. The buttercream may become broken like scrambled eggs again, but it will come back together. 3. 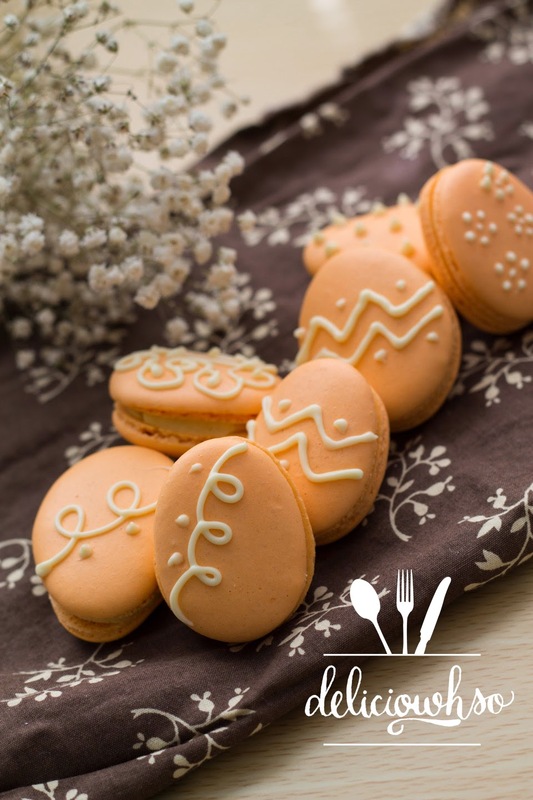 Put the buttercream into a piping bag with the same tip that you used to pipe the macarons. 4. Pipe the buttercream so that it is covering about 1/2 of the surface of the bottom of the shell. 7. 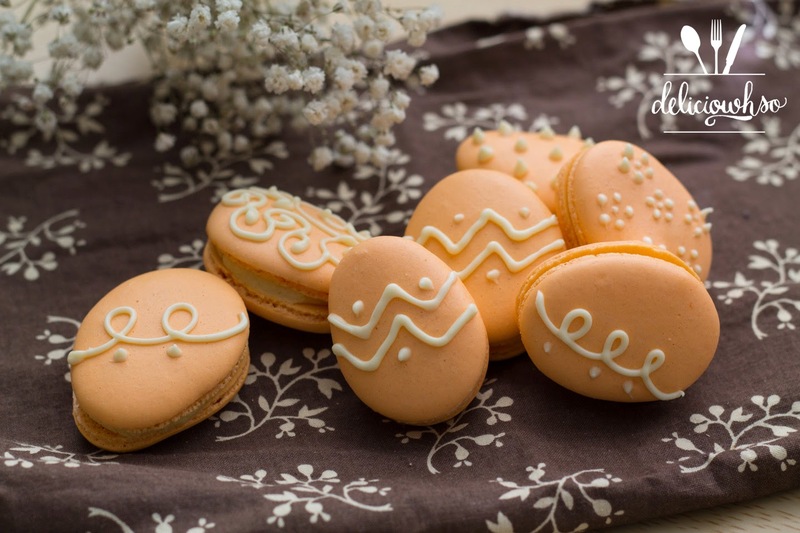 Melt white chocolate and pipe designs onto the macarons. Place them back into the fridge to set up. 8. Let the macarons come to room temperature before you serve them. These macarons are interesting and fun. They're a great play on the classic creamsicle, with a fun twist. The piping technique takes a few tries to get just right, but it's worth practicing! How cute are these? Once again, Happy Easter everyone!